1. Wash the fish pieces very well . Rub the fishes with little turmeric, chili powder and salt . Fry them for a while . Don’t take too long to fry them. Just two minutes or so for each side. Keep them aside. 2. Add chopped onion and fry them until translucent. Add the onion paste, ginger-garlic paste , turmeric, chili powder, cumin, coriander powder, salt with little water . Cook the spices very well ,adding water little by little. Add the cauliflower and beans . Cook for a while. Now add enough water to cover them . Cook them on medium heat. When the water reduced a bit , add the fish pieces. 3. When the gravy is reduced and almost to desired consistency add the tomatoes and whole green chilies . Cook for another 5 minutes on medium -low heat or until comes the desired consistency . Turn off the heat and add the chopped cilantro. Cover with lid and keep it on the stove for a while . The stove must be turned off. For Special Garam Masala Powder grind half teaspoon of cumin, half teaspoon of whole coriander, 4/5 cloves, 3/4 cardamoms,half teaspoon black/white pepper, 1 teaspoon poppy seed , little mace and nutmeg together into a fine smooth powder. 1. Marinate the chicken pieces with 1/8 th cup yogurt and and salt. 2. In another bowl tale half cup pf yogurt, whisk it and add ginger paste, garlic paste, salt, tomato sauce, tamarind sauce, chili powder, coriander powder, garam masala powder and food color in it.Mix well. 3.In a wok heat oil+ghee and fry the chicken for a while. Keep aside the chicken pieces ..
4.Now add bayleaf, cinnamon and 2 cardamoms in the oil , fry a little then add chopped onion and fry until they turn brown.Pour the yogurt mix and the chicken. Add little water and cover with a lid. When oil separates add sugar and handful of green chilies. Add maowa/khoya…Turn off the stove and keep the wok on it with lid on for 5 / 10 minutes. Enjoy your Chicken roast with Polau/ Pilaf, Paratha..
1. Combine all the ingredients mentioned for the kofta. Many people use potato or cornflour for binding. But PLEASE DON’T DO this for Chitol kofta. Beaten egg will serve the purpose. When done place it in refrigerator for 15/ 20 minutes, it would help to shape the balls. 2. Boil some water . Now when the water comes to the boiling point make balls with the fish mixture and drop gently into the water and wait till the color changes. it will take no more than 2/3 minutes at best. Take out the balls from the water. But don’t throw away the water as we are going to use it in our cooking later.Save the water. 3. In another pan, heat oil, add the bayleaf, cardamom, cinnamon and fry for a while. Add the onion paste, ginger paste, garlic paste, chili powder, coriander powder, cumin powder and salt. Cook adding water little by little ( you may use the water saved after boiling the koftas) . Cook very well now add water and put the koftas in it. Cover the lid , cook until it comes to desired consistency. Add some green chilies and turn off the stove. Keep the pan on the stove covered for 5 minutes or until the oil separates. 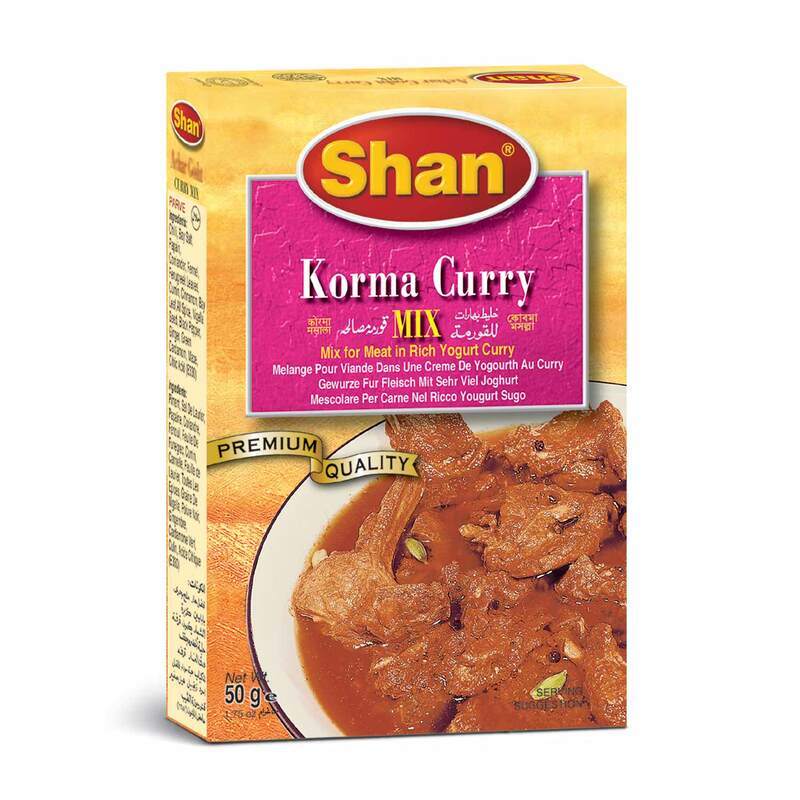 I love this product.Try this Korma Curry Mix . 1. Combine all the ingredients mentioned for kofta/ meat ball. Make round ball out of this and deep fry on medium low flame . 2. Heat oil in a wok and add bay leaf, cardamom, cinnamon.Fry for a while, then add onion paste ginger paste, garlic paste, chili powder , Shaan Korma Curry Mix( 1 Tbl spoon), salt and cook adding water little by little.. Beat yogurt with water and add . Cook for a little while then add hot water and add in the kofta/ meatballs. Cover the lid. Cook on medium heat. 3. Make sure the gravy gets into the koftas..When the gravy is reducing to your desired consistency add the bell peppers if u wish. Sprinkle garam masala powder .Cover the lid and turn off the stove keeping the wok on the stove..After few minutes oil will separate and your Beef Kofta Korma Curry is ready!!!!!!!!!!!!!! 1. 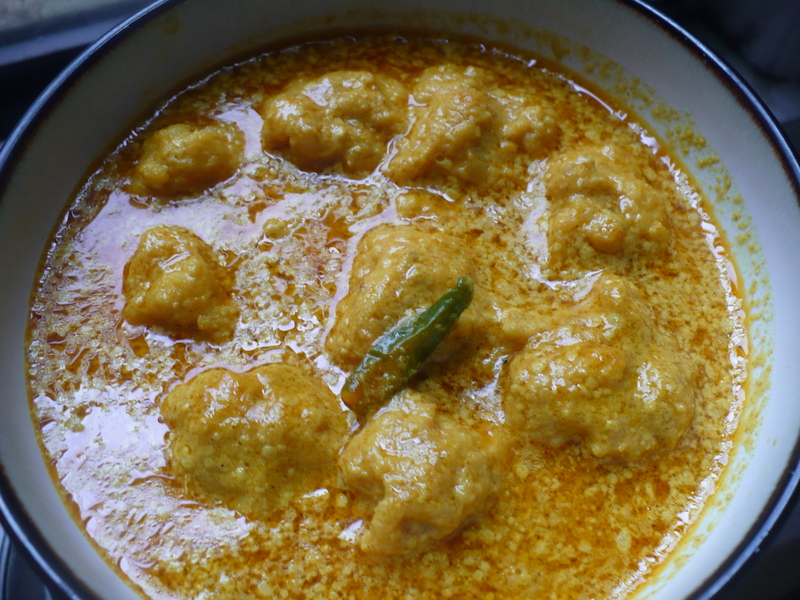 While making Korma curry , try to use sweet yogurt along with regular white yogurt. Trust me it enhances the taste. Like , if the recipe calls for 1/4th cup of yogurt take 1/8 th cup sweet yogurt +1/8 th cup regular white yogurt= 1/4 th cup of yogurt. 2. If You are not using Shaan Korma Curry Mix , then add a special garam masala powder the same quantity as mentioned in the recipe. For that Grind , cumin, cardamom, whole coriander, mace ( joyeetree/javetri) , Jaifol( nutmeg), fennel, clove, white/black pepper together into a fine powder and use accordingly. 3. 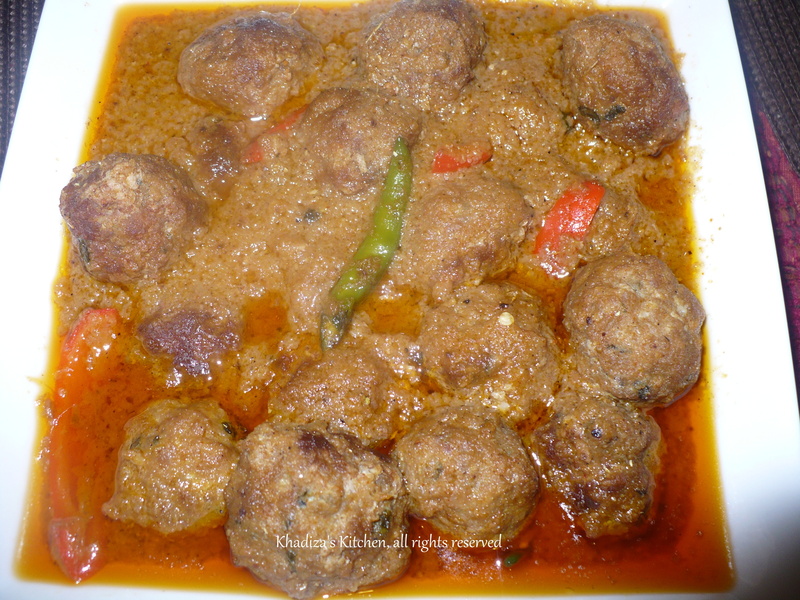 This Kofta can be used in various recipes..Like you can try the Koftas in Korma curry style, you can use it in oriental way or even plain curry way..Either way it’s great!!!!!!! There are two parts of this cooking. The first part is to make Shrimp korma and the second part is to make polau with that. 1. Shell, de-vein and wash prawns well. 2. Heat oil in a pan and add the prawns. Fry a while .That would help to keep the flavor of shrimp intact even after adding spices.Now add the whole garam masala , fry a little while now add the onion paste, ginger paste, garlic paste, chili powder, salt and little water. Cook well adding water little by little. Now add the coconut milk and cook it until the gravy reduced to half . 3. In another vessel heat ghee+oil . Now add the Whole garam masala and onion.Fry until brown. Add the rice(soaked and drained). Add the ginger paste and salt ( don’t use too much salt as we have salt in the shrimp gravy too) .Fry for a while. Now add the shrimp with the gravy.Add 3 cups water ( for 2 cups of rice). Cover the lid. Careful not more than that as we have already used the gravy.Cook on medium flame.Don’t stir while cooking your polau, that would make your polau gooey and sticky. 4.When the water is almost dried out add some green chilies. Now you can stir only once with a very light hand without breaking the rice , so that the bottom must not get burnt..
5. Keep it on very low flame for another 10/15 minutes. What I do I use double-boiler system. I place my Vessel over another vessel filled with water and let it cook on the steam.It works like magic. Your Shrimp Polau is ready..Bon A Petit!!!!!!!!!! 3. Mustard( yellow mustard) Paste/ shorshe bata 1 tbl spoon ( 1 tblspoon mustard+1 teaspoon poppy seed. 1.Trim stem ends off okra. 2. In a pan heat oil on medium heat. Fry the shrimps a while. Add chopped onin. Fry until soft and transparent.Add chili powder, turmeric powder with little water and salt. 3. Cook well adding water little by little. Add the Mustard paste (I made the paste with 1 teaspoon of poppy seed or posto) with little water, cook for 1 minute and at this point add the okra. 5. When the water is drying out add the green chilies. 6. Turn off the stove when oil separates. You may add a dash of mustard oil , if you used regular oil while cooking it. 1. Many complains that their mustard paste tastes bitter. For them I’d love to give some tips. 😀 . a) There are two types of mustard, one is black and the other is yellow. Black mustard is used for ” Foron” or in doing sautee. But for mustard paste, used in recipes like shorshe Ilish, shorshe dherosh and so on alwayz use the yellow one. Black mustard is bitter, on the other hand yellow mustard is not that bitter like the black one. c) Now a dayz we hardly make paste with traditional ” Pata-Puta”/ “Shilnora”. One thing to be remembered with your blender/ grinder you can never make a smooth paste of mustard . So what I do , I grind them into a powder then add water. Cover it with something for a while. While using just drain out the extra water. It helps it not to be bitter too. 😀 ..
d) Every time you add mustard paste in oil make sure you add it with little water, otherwise the direct heat will dry out the mustard and cause bitterness. 2. If you don’t want to cook this completely with mustard oil. You can use regular oil while cooking but don’t forget to add 1 teaspoon of mustard oil/ shorishar tel before you turn off the heat. 3. Don’t cook your okra with lid on. That would ruin the color of okra. 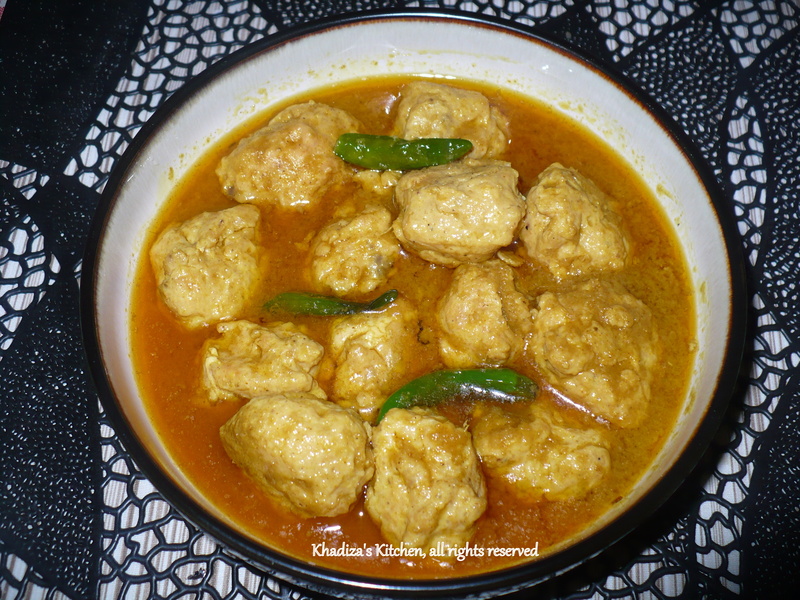 Kofta Korma Curry of Rohu Fish/ Rui Macher Kofta Korma Curry..
Not only Rohu ,you can use any other big fish to make this “out of the world” kindda dish. 1.Boil your fish with garlic/ginger paste, turmeric and salt. While boiling use less water, because fish exerts water and only a little amount is needed to boil them. 2. Take out all the bones and put into a bowl. 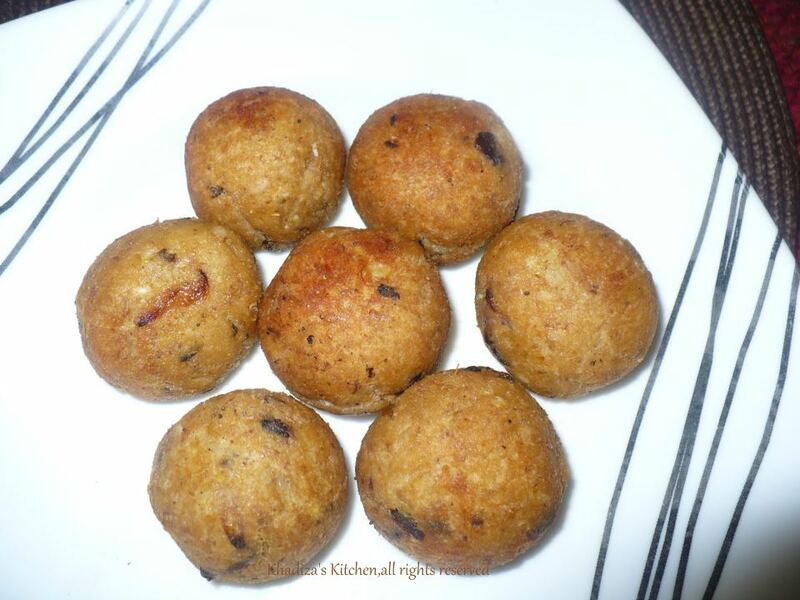 Combine mashed potato, chili powder, garam masala powder, salt, fried onion, beaten egg and bread crumbs with it. 3. Make round balls and deep fry and set aside . But since it will be used in Korma Curry, don’t fry them for long. The color needs to be light. 1. Heat oil and add Whole garam masala, elach, darchini, tejpata. Fry them a while. Then add the onion paste, ginger-garlic paste, chili powder, coriander powder and salt. Cook them well adding water little by little, then add beaten yogurt.Cook well adding water little by little. When done add water and put the koftas in it. 2. Cover the lid. Cook until comes to desired consistency. Then add special garam masala, cubed bell pepper / capsicum and green chilies. 3. Keep it on very low flame for 5 minutes until oil separates. Enjoy your Kofta Korma Curry!!!!! Goes best with Polau/ Pilaf or Khichuri! 1. 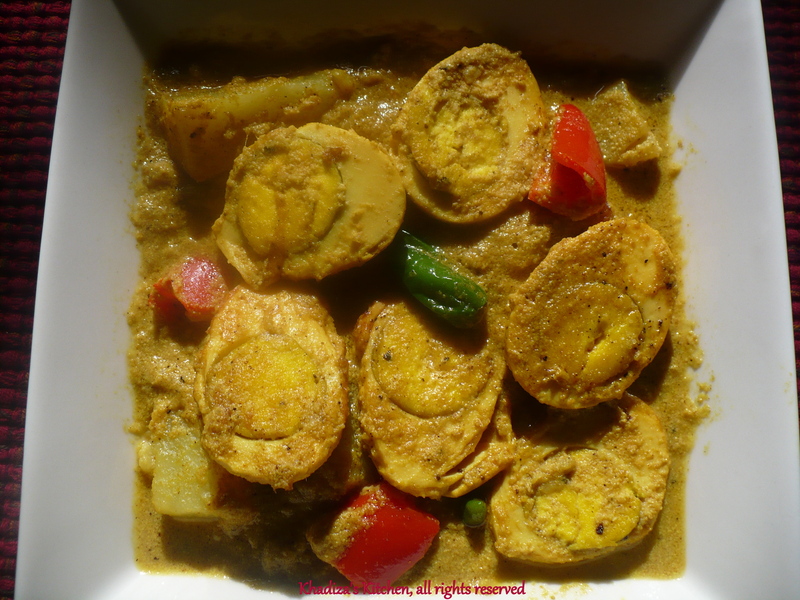 In the kofta curry, try to use sweet yogart along with regular yogart as it enhances the taste. If you don’t have sweet yogurt at home, don’t worry.. Just mix a little sugar and tomato ketchup with your yogurt.. It works fantastic as well!!!!!!!!!!!!! 2. 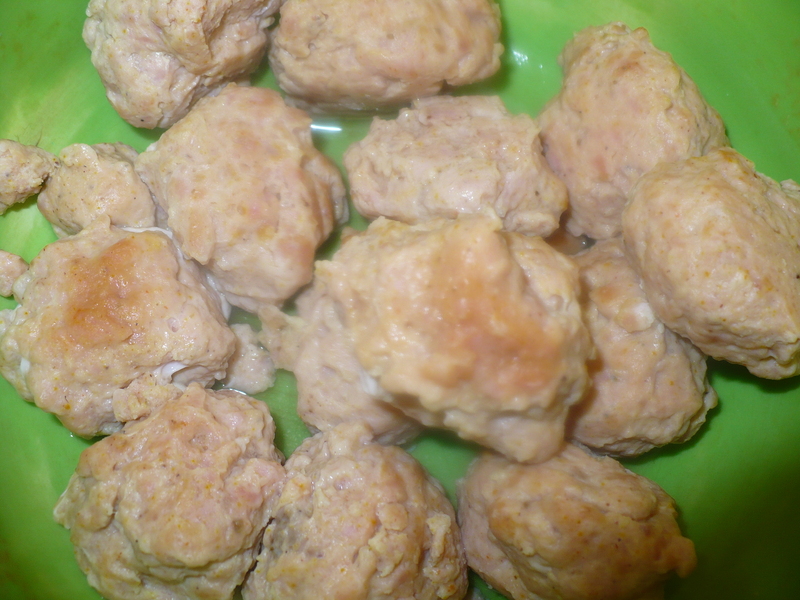 You can make so many different dishes with this basic kofta recipe. You may add it in your oriental style sweet n sour fish ball or likewise. You can cook it in coconut milk or you can just add it in curry. In these cases just add turmeric powder while cooking it like curry or in coconut milk. But if you use coconut milk, omit the yogurt. 3. 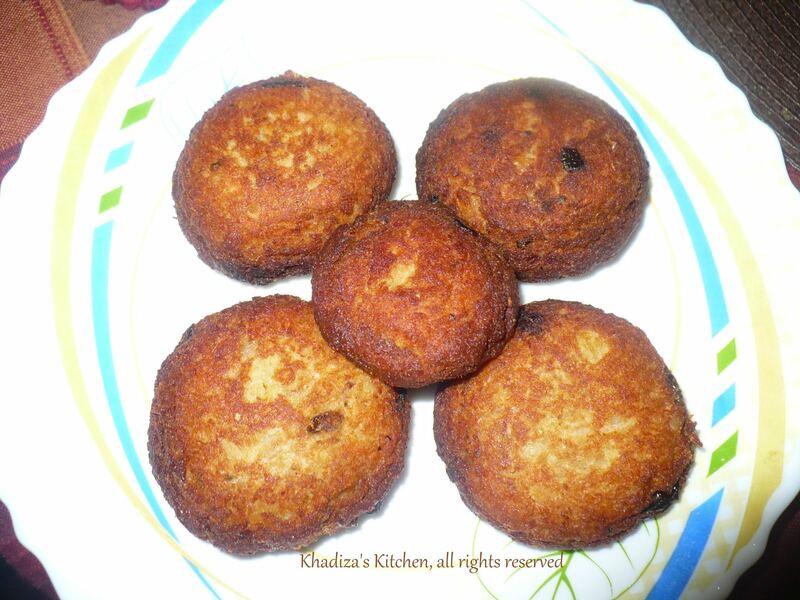 As I said before, this basic kofta recipe can be used in so many recipes.I made fish chop/kabab with it. Just flatten the balls and deep fried it like chop and kababs on medium low heat until nice brown!!!! 4. You can store this kofta/kabab in the deep fridge for a atleast 2 weeks. But for that don’t fry them. Just take them out when needed, fry and use it the way you want!!!!!!!! 1.Shell, de-vein and wash the prawns. DON’T FORGET TO TAKE OUT THE SHELL OF THE SHRIMP!! We need half pound prawns/shrimps for this recipe. Now blend the prawns into a smooth paste.We don’t need any water while grinding it. 2. Add little ginger paste, garlic paste, salt, little turmeric powder and 1 beaten egg. Unlike others We are not going to fry the balls before we add them in the curry. The tenderness of the prawns will be vanished if u fry them before adding them in curry. So keep it in the fridge for 15 mins that would help us to shape them. 3. Heat oil in a wok.Add bay leaf, cardamom, cinnamon. Fry a little then add one medium sized finely chopped onion..When the onion is almost golden brown, add 3 tbl spoon onion paste, 1 tbl spoon garlic paste, 2 tea spoon ginger paste, turmeric and chili powder,a little coriander powder and salt to taste. 4.Keep stirring all the time and adding water little by little to keep the spices from scorching. This iS what we call “koshano” in Bangla. This ” Koshano” is very important in every Bengali or Indian Style curries. 5.Now add a little water and cook a little while then add 1 cup medium thick coconut milk ( I used coconut milk powder available in the store to make the milk ) and 1 cup of regular liquid milk ( My grandma used to cook only in coconut milk , but I improvised a little). Here comes the fun part!!!!!!! Make round balls from the prawn and add into the gravy.Cover the lid. 6. 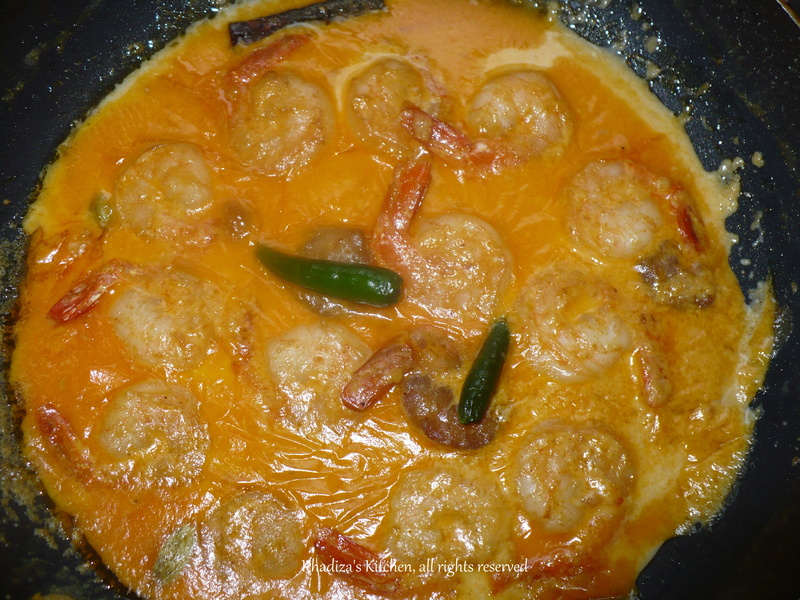 Cook it for at least 10-15 minutes at medium low flame or until the oil separates and the prawn balls r cooked. 7. Roast whole cumin, poppy seed ( posto), cardamom (elach)together. You can microwave them for 30 second and grind them into a fine powder.Add this powder and green chillies before u turn off the stove.